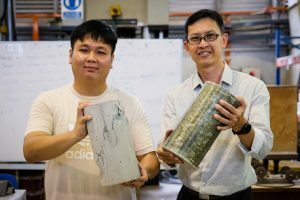 NTU Singapore and JTC have jointly developed a new ready-to-stick wrap for repairing and reinforcing existing concrete structures. The wrap is especially useful for ageing infrastructure like buildings and bridges which suffer from cracks and delamination of concrete. The Fast Wrapping Fiber Reinforced Polymer (FasRaP) solution is an outcome of a collaboration between NTU, JTC and Prostruct Consulting. The main component of the ready-to-stick wrap is glass fiber. These fibers are infused with a proprietary NTU glue-like resin that acts as an adhesive for the wrap. According to the scientists, the resin hardens only when exposed to light. This allows it to be pre-applied in the factory and packaged into a ready roll of sticky wrap. FasRaP can be directly applied on the wall or pillar when brought to a work site, the scientists report. Only three workers are needed to complete the job as compared to commercially available FRPs which typically require a team of six to install. Pre-fabricating FasRaP with resin glue in the factory also ensures consistency in quality since conditions can be better controlled and monitored compared to manual application of resin on-site. The ready-to-stick wrap has so far proven to be just as strong as conventional FRP in industry-standard blast tests conducted by the team. This is of paramount value to builders as it falls in line with the Infrastructure Protection Act passed by the Singapore Parliament in October 2017. Moreover, tests have shown that a pillar wrapped with FasRaP can withstand an additional 80% load when compared to a bare concrete pillar without reinforcement. Drawing light on the team’s invention, lead project investigator and NTU Associate Professor Ng Kee Woei said that the new quick-fix wrap solution should help companies stem manpower costs, increase efficiency and make structural reinforcement much easier to execute. The researchers are now working on commercializing their technology, and are currently in talks with both manufacturers of FRPs and industry contractors using FRPs. JTC on its part is identifying suitable infrastructure projects to deploy FasRaP as a means for accelerating its early adoption and development.